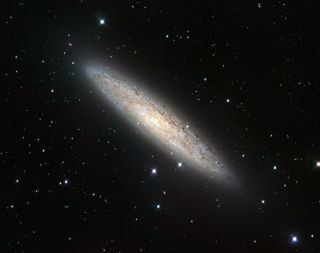 The European Southern Observatory's VLT Survey Telescope has captured the nearby spiral galaxy NGC 253 in sharp detail. This new portrait, released on Dec. 15, 2011, is probably the best wide-field view of this object and its surroundings ever taken, scientists said. A nearby spiral galaxy's beauty is revealed in one of the most detailed images ever taken of the object and its surroundings. The European Southern Observatory's VLT Survey Telescope, at the Paranal Observatory in Chile, took the new portrait of galaxy NGC 253, which is located about 11.5 million light-years from Earth in the southern constellation of Sculptor. The shimmering galaxy is often simply called the Sculptor Galaxy, but because of its shape, it has also earned the nicknames Silver Coin or the Silver Dollar Galaxy, ESO officials said in a statement. NGC 253 is one of the brightest galaxies in the sky after the Milky Way's galactic neighbor, the Andromeda galaxy. This makes it easy to spot NGC 253 using binoculars, the researchers said. Astronomers have labeled NGC 253 a "starburst" galaxy because of the rigorous star formation taking place. The bright clumps speckled throughout the galaxy are stellar nurseries where hot, young stars are being born, the scientists said. Radiation streaming from these giant newborns make the surrounding hydrogen gas clouds glow brightly (colored green in this image). NGC 253 was discovered by the German-British astronomer Caroline Herschel, the sister of famed astronomer William Herschel. Caroline found the spiral galaxy in 1783 as she scoured the cosmos for comets. This image of the galaxy was taken during the VST's scientific verification phase, which is when the telescope's scientific performance is checked out before it enters full operation, ESO officials said. Astronomers are combining data from the VST with infrared images from ESO's VISTA telescope, also at the Paranal Observatory, to identify the younger generations of stars in NGC 253. Zooming into this new image of the spiral galaxy uncovers star-forming regions in the spiral arms of NGC 253, ESO officials said. The picture also reveals a rich tapestry of more distant galaxies in the cosmos.